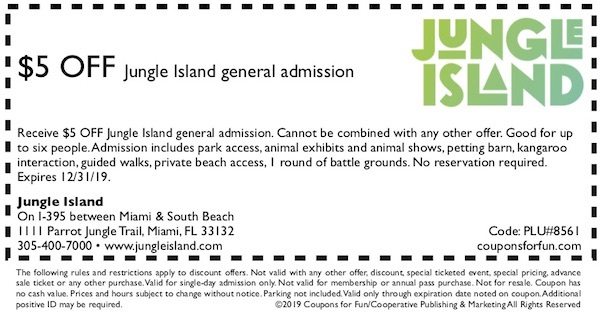 Jungle Island in Miami, Florida - Get savings coupon! Jungle Island, a favorite South Florida landmark, is an eco-adventure park between Downtown Miami and South Beach. Building upon a rich tradition that began in 1936, the recently-transformed Jungle Island takes guests on an epic journey through nature, animal discovery, and new adventurous experiences. New amenities include SuperFlight, Escape Rooms, renovated events spaces and its expansive Bloom Ballroom. The 18-acre park is truly Miami's most iconic destination for events and adventure. From behind-the-scenes VIP tours to unforgettable interactions with some of the world’s most fascinating animals, Jungle Island offers guests a variety of real-life jungle experiences. Enjoy one day of access to Jungle Island, its spectacular shows, unique animal exhibits and fun children's play area, all set among a lush, tropical environment. Jungle Island is home to animal wonders including lovable lemurs from Madagascar, the only tame cassowary on the planet, parrots, twin orangutans - Peanut & Pumpkin - and much more. In addition, take part in memorable experiences including a visit down under with the Australian red kangaroos and feeding of animals at the petting farm. Includes: Park access, animal exhibits and animal shows, petting barn, kangaroo interaction, guided walks, private beach access, 1 round of battle grounds.